BBC cameraman Ron Skeans was attacked by a Trump supporter yelling anti-media slogans during the US president's rally in El Paso, Texas, late Monday. Donald Trump was addressing a rally in El Paso, Texas. The British Broadcasting Corporation has asked the White House for a review of security arrangements after a BBC cameraman was assaulted at a Donald Trump rally. Paul Danahar, the BBC's Americas bureau editor, said in a tweet Tuesday that he had asked White House Press Secretary Sarah Sanders for a "full review of security arrangements after last night's attack." "Access into the media area was unsupervised," Danahar said. "No one in law enforcement intervened before, during or after the attack." "There was no swift action to prevent or interrupt the attack by any security agency," he said. The White House Correspondents'' Association condemned the attack. "We are relieved that, this time, no one was seriously hurt," said WHCA president Olivier Knox. "The president of the United States should make absolutely clear to his supporters that violence against reporters is unacceptable." 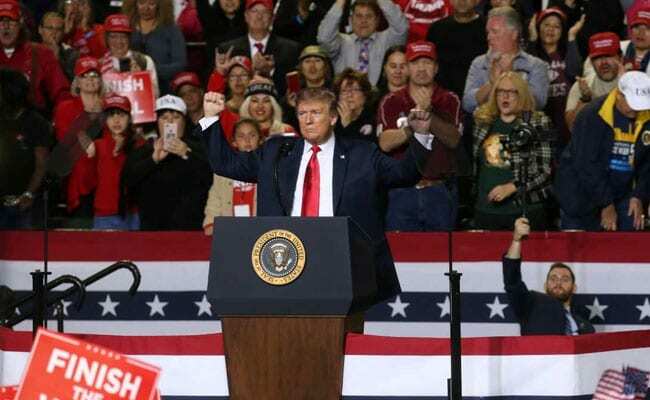 BBC Washington correspondent Gary O'Donoghue, who was covering the El Paso event, said his cameraman was pushed and shoved by the unidentified assailant "after the president repeatedly goaded the crowd over supposed media bias." "Happily, Ron is fine," O''Donoghue said. Trump paused his remarks following the commotion in the crowd and -- pointing at the media -- asked "You alright? Everything OK?" He resumed his attacks on the press later in the speech, referring to the "totally dishonest media." New York Times publisher AG Sulzberger urged Trump during an interview last month to tone down what he called his "potentially dangerous" rhetoric towards the press.